As a musician, one of the biggest challenges you will face is finding ways to expose your music to a wide audience. 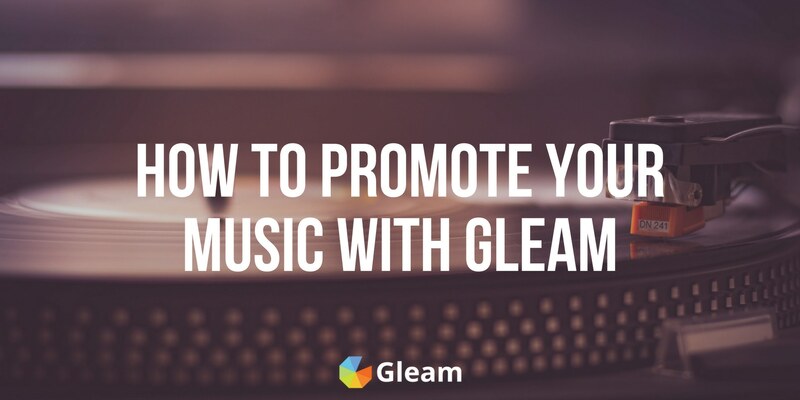 Finding a relevant, sizeable audience and promoting your music to them can be a difficult and time consuming task, but luckily for you Gleam has a suite of powerful apps which can help you promote your music in a more effective and less time consuming way. We've put together this guide filled with highly effective promotional strategies for new and established artists alike looking to promote their music, drive ticket sales and grow their online following. So if you want to ramp up your promotion and increase your presence as a musician - just keep reading. When it comes to generating awareness and driving user action there's arguably nothing more effective than running a giveaway. Gleam's Competitions app allows you to easily set up and run powerful campaigns which drive real user engagement. So if you're looking for a great way to promote your music and grow your audience, then running a giveaway is definitely for you. You may not want to use all of the entry methods we've incorporated into this campaign, but it should give you an idea of some of the types actions you can drive with a giveaway. If you want to grow as a musician then it's imperative that you are constantly growing your audience, engaging your fans and promoting your music. Social media is perfect for this, and you can use a giveaway to drive actions across a variety of platforms (including Facebook, Twitter and Instagram) which will help you extend your promotional reach and engage your audience. Or to those who follow you on Twitter. You can also use giveaways to promote particular messages by getting users to view particular posts on Facebook or Instagram, or Retweet one of your Tweets. This can be an outstanding way to spread a message of particular importance. If you're releasing a new album or song, going on tour or playing at an upcoming festival then it's a great idea to announce it on social media and use a giveaway to spread the message around. If you use SoundCloud to upload, share and promote your music then you can use giveaways to drive some serious engagement on the platform. 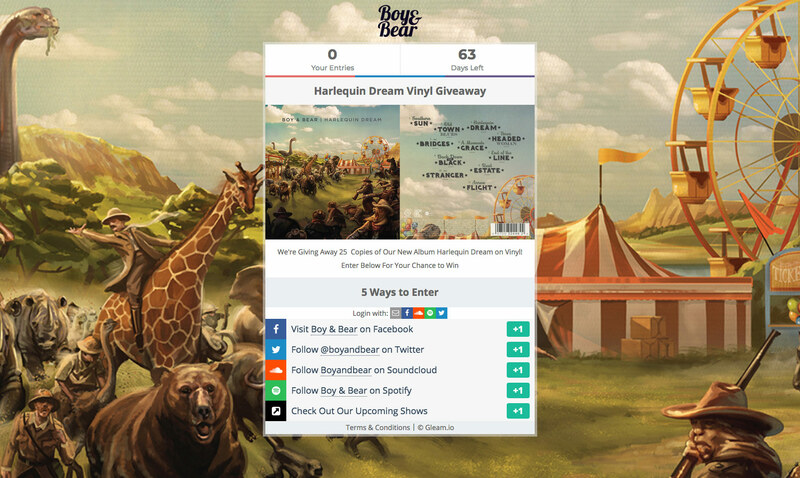 When you run a giveaway with Gleam Competitions, you'll be able to drive a host of SoundCloud actions which all work to raise awareness, gain exposure, share your music, and find new fans. 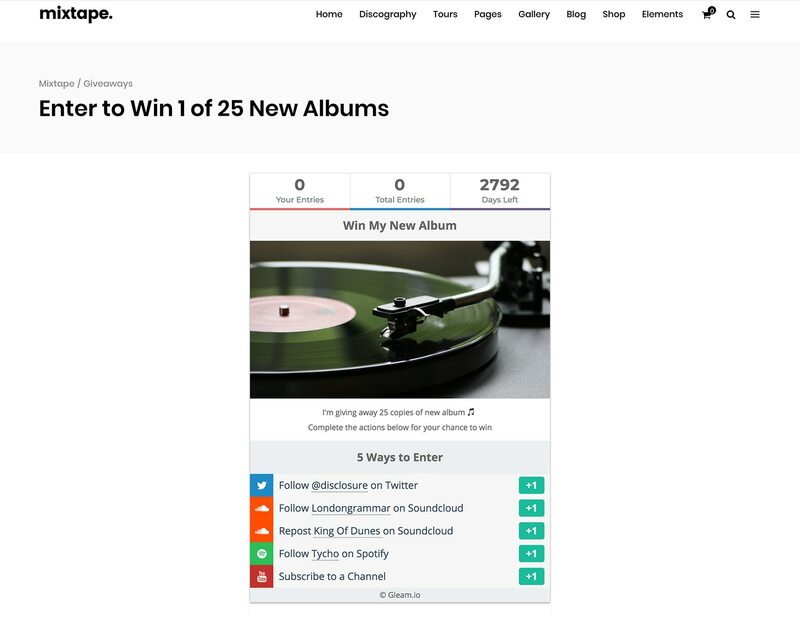 If you're active on Spotify then you can use Competitions to get users to check you out on the platform and help you gain some traction. You can even get users to pre-save one of your tracks or albums so it will automatically appear on their account upon its release. 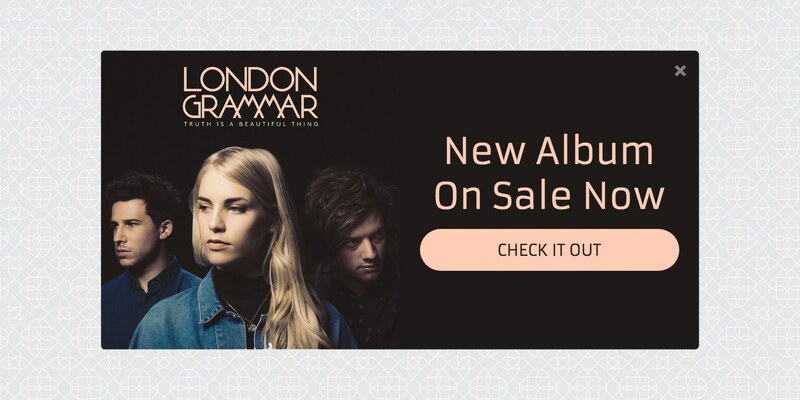 This is an outstanding way to promote your upcoming releases. These are all terrific ways to get users who may be unfamiliar with your music to check out your work and potentially become regular listeners. If you upload songs, music videos or anything else to YouTube and want to grow your presence on the platform then you can use your giveaway to drive YouTube channel visits and encourage entrants to check out your content. If you have a website dedicated to your music then you can drive traffic with Gleam's Visit Action. You can use this tactic to drive traffic to your website's home page, or any other page you want to draw attention to. This includes pages where users can buy or sample your music, check out your touring schedule or grab some merchandise. You don't even have to send users to your own website. If you have music or concerts being promoted or sold on a 3rd party website it can be a good idea to send users to those sites as an entry method. When it comes to making announcements, keeping your fans up to date with your activity and promoting your music and shows, there isn't much you can do which will be more effective than building a mailing list and engaging in some email marketing. A great way to give your mailing list a boost is by using the Subscribe Action to encourage signups from your giveaway participants. If you want your giveaway to gain viral traction then you should definitely incorporate our Viral Share Action into your campaign. You can use it to reward users with extra entries for referring their friends to the giveaway. This is a great way to gain additional awareness and drive actions from an audience who are likely to have an interest in your giveaway and music. You can award different amounts of entries for the completion of different actions in your Competition. This is a great way to add some extra incentive to complete the actions that are most important to you. Ready To Run Your Own Competition? Check out our documentation on setting up your own Competition or get started right away! If you run your giveaway with Gleam then you have the option of embedding the campaign directly into your website or blog. This is a good move for two main reasons. Firstly, it will allow you to encourage entry from the highly relevant users who have already visited your site. Secondly, you will be able to drive users looking to enter your giveaway to your own website. This is a great way to showcase everything your website has to offer including your music, tour dates and merchandise. You may even be able to drive some immediate sales. You can even draw extra attention to your campaign from within your website by installing the Competition in a popup tab or overlay and presenting it to visitors at a time of your choosing. Gleam automatically creates responsive Hosted Landing Pages for all campaigns, so if you don't have a website you can simply send traffic to your giveaway's stylish landing page and have them enter from there. You also have the ability to style your Hosted Landing Page in a variety of ways which will help add a sense of personalisation and professionalism to your giveaway. Another option you have is to install your campaign in a Facebook tab. This is a terrific way to reach an audience and drive entries, especially if you maintain an active presence on Facebook. When you run a giveaway, another important decision you'll need to make is what exactly you want to give away. Your prize is what will ultimately encourage entry, so it's important that you get it right. Your prize should be valuable enough to incentivise entry and be specific to your target audience so you don't attract unwarranted attention from irrelevant users. As a musician, you have several options for high-quality and engaging prizes which will drive entries from users with a real interest in your music. Tickets to a show you're playing. Tickets to a music festival you're performing at. A hand-selected bundle of your favourite albums. Promotion is a crucial component of any giveaway. If people don't know about your giveaway, they won't enter it. It's as simple as that. If you want your giveaway to reach your target audience and drive real action then you need to make sure that you're using the right promotional channels and tactics. When it comes to promoting your giveaway, there may not be any platforms more effective than social networking sites like Facebook, Twitter and Instagram. Your social media following is likely to be made up of individuals who have an interest in your music and will be ready, willing and able to enter you giveaway and share it amongst their own social circles. It's because of this that announcing, promoting, and linking to your contest across all of your social media channels is always a great idea. If you haven't yet accrued much of an online following you can even promote the giveaway from your own personal social media account. If you use SoundCloud as the base for your music then it's a good idea to also use the platform to promote your giveaway. Add a section to your SoundCloud bio which briefly describes the giveaway and links off to it. Create a header image which promotes your giveaway and keep it on your profile for the duration of the campaign. 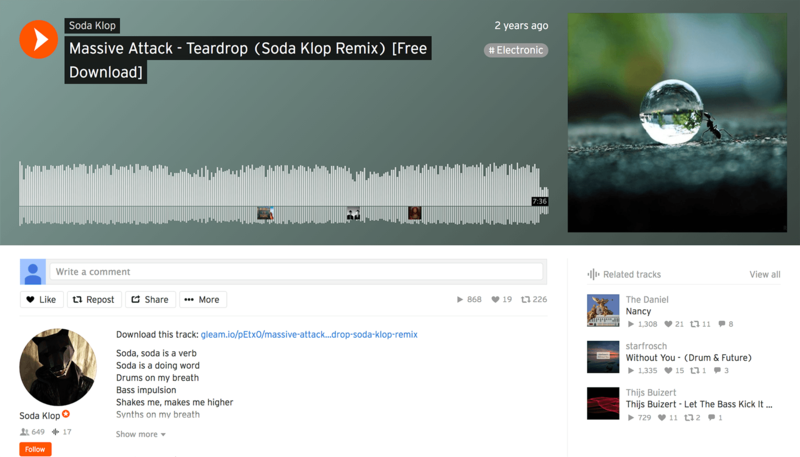 SoundCloud allows users to embed links to social media profiles or websites on their profile. You can use these links to direct users to your giveaway. If you're also active on Spotify you can also link off to your giveaway from your About section. One of the best ways to promote a giveaway is with the giveaway itself. By using Gleam's Viral Share and Social Media actions you will be able use your giveaway to incentivise its own sharing. This is a terrific way to gain constant exposure from new, relevant audiences. Check out our in depth guide for all the information you need on promoting your giveaway. In the aftermath of your giveaway, you're likely to have exposed your music to a wide audience and bolstered your fanbase and social media following. This in itself is outstanding, but it's important that you engage your newfound following in order to maintain their interest and drive further action. If you ran a campaign which gave away your music or show tickets then you can be confident that the new audience you have amassed is interested in getting their hands on your music or attending your show. Because of this, it's a great idea to follow up your giveaway by offering discounted music or tickets. This will help you drive sales from a highly targeted audience and elevate your audience relationships to the next level. A great way to offer discounts is by using Gleam's Rewards app to offer discount codes to users who complete designated actions. If you want to learn more about running your own Rewards campaign click here. Once your giveaway has concluded, you should be left with an increased online following. If you want to convert these new followers into long-term fans and supporters then it's important that you start engaging them right away, and there might not be a more effective way to do this than releasing some new music. Coinciding the conclusion of your campaign with the release of a new track or album is an outstanding way to both solidify your new fans' interest and ensure that you're launching to a sizeable audience. Another great way to keep your new audience engaged and interested in you is simply by maintaining frequent and high-quality activity across all of your social media platforms. Posting your music, live performances, behind the scenes content and anything else you think your fans will enjoy is a great way to keep fan interest high and ensure that when you announce new music or shows you will have a highly engaged audience ready to go. If you have success running one giveaway there's a very good chance you'll keep having success with more. Making giveaways a regular component of your marketing activity can be a terrific way to constantly engage and expand your audience while also promoting particular offerings such as a new album or an upcoming tour. You don't have to offer overly extravagant prizes. Giving away a few albums or concert tickets on a regular basis won't cost you much, and it can provide you with a whole lot of promotion. Gleam makes it easy for musicians to drive awareness and grow their social following. If you have an upcoming show with a lot of interest and limited availability then it's a good idea to create a ticket ballot system where users enter a draw and a designated number of entrants are given the opportunity to purchase pre-release tickets before they go on sale to the general public. Even if you're not expecting to run out of tickets, pre-sale ballots are still a terrific way to raise awareness, generate hype, insight some FOMO and ultimately drive ticket sales. You can create a simple ballot where entrants can sign up with their email address to enter the ballot like the demo we've created below. Use your User Details Form to require users to login to your campaign with their email. Make sure you tick Require logins before actions, Automatic entry, and Build Competition Subscriber List. This will automatically enter all users who complete the form into your Competition so you don't have to worry about entry actions. Your prize will be the opportunity to purchase tickets, so ensure that the number of winners you select is equal to the amount of pre-release tickets you want to offer. Once the campaign has ended, email all winners a link to where they can purchase their pre-release tickets. If you want to use a pre-release ticket ballot to drive powerful promotional actions then you should create a ballot contest with Gleam's Competitions app. If you want to give users some extra incentive to enter beyond the prospect of guaranteed tickets you can try offering discounted tickets to users who are drawn from the ballot. This can be fantastic for raising interest and driving more actions. A highly effective and engaging way to promote your music is by offering up free downloads of your tracks to users who help share your music or complete a variety of other powerful actions. This strategy is known as a content or download gate, and with Gleam's Rewards app you can create your own with precision and ease. You may not want to drive the exact same actions as in this demo, but it should give you an idea of how a content gate functions. Setting up your own content gate with Gleam Rewards is a straightforward and intuitive task. It's just like setting up any other Rewards campaign which you can learn all about here. The key difference between a content gate and other types of Rewards campaigns is the actual reward you offer. 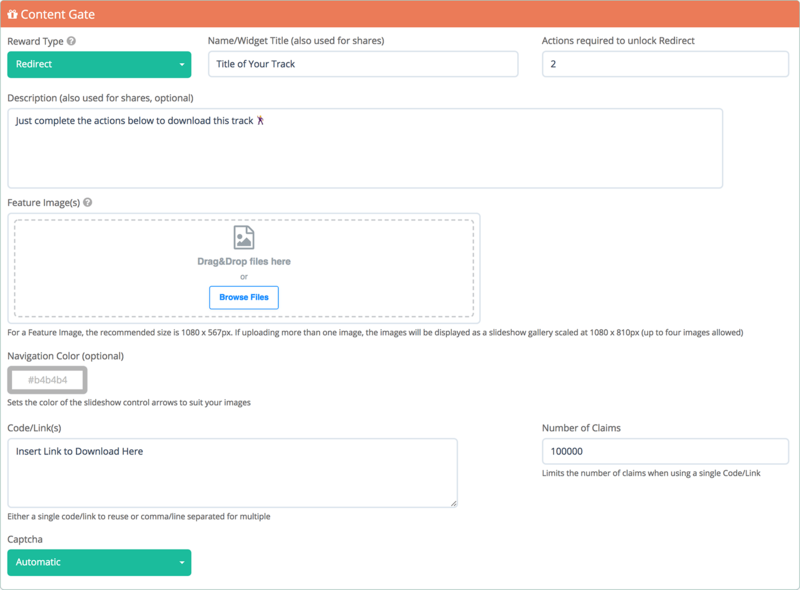 To create a content gate you will need to set the Reward Type to Redirect and provide a link to a page where users can download your track. This can be a Dropbox link or something equivalent to one. If you setup a content gate, you will need to decide on the actions you want to drive. You're giving away song downloads for free, so it's important that you're getting enough back in return. The best actions you can drive are those which will expose the user to more of your music, and those which will share your music with a new audience. If you want to use your campaign to disseminate your music and find new listeners then one of the most powerful actions you can drive are SoundCloud Reposts. This is an excellent way to expose your music to a new, relevant audience and grow your following. If you include a link to your download gate in your track description on SoundCloud you will be able to create a viral loop effect where listeners who want to download your track share it with their friends who then go on to do the same. Another way you can get users to share your music is by asking them to Retweet a post of yours which links off to your music. If you opt to use this action it's a good idea to share a Tweet which contains a sample of your track, a link to wherever listeners can find your music, and possibly even a link to the content gate campaign. Users seeking out your gated downloads have already shown a clear interest in your music, so while you're asking them to complete actions, it's well worth taking steps to retain them as listeners. Share links to your content gate across all of your social media channels. Your online following is made up of the users who are most likely to help share your music around, so it's important that you make sure they know about the campaign. Embed the campaign in a page or popup tab on your website. This is a great way to drive action from users who have already shown interest in your music. Add links to the campaign on your SoundCloud page and in the description of the song you are promoting itself. If you're getting users to share around a particular song then this is a great way to get referred listeners to enter the campaign themselves and create a viral loop effect where your music is constantly being listened to and promoted. Check out our documentation on setting up your own Rewards campaign or get started on your own Content Gate right away! Content gates aren't the only type of Rewards campaigns you can run to promote your music. With Gleam you can set up various other Rewards to help you drive sales and social actions. 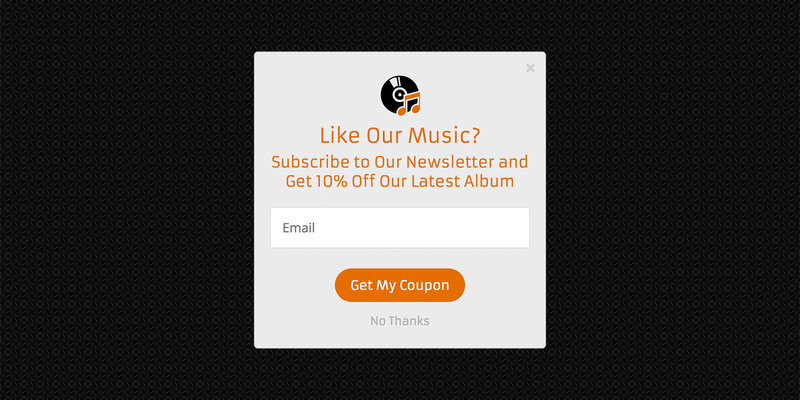 A fantastic way to incentivise users to share your music and complete other social actions is by creating a Coupon Reward and offering up discounts on your music or show tickets. What makes this tactic so effective is the fact that by providing discounts on your own offerings as a Reward you won't only be able to encourage an array of social actions, you'll also be able to drive album and ticket sales. When you run this type of Rewards campaign you will need to decide exactly what actions you want to drive. You can use your campaign to reach a new audience by getting users to share your music on SoundCloud or Twitter, or you can bolster your following by getting users to follow you on a range of platforms including Twitter, SoundCloud, and Spotify. You want to encourage as many users as you can to enter the campaign, so it's generally a good idea to limit what users have to do to a couple of high-value actions. If users have to do too much they're far less likely to enter than if they only have to complete 1-3 actions. You can also use a Rewards campaign to drive sales by offering potential customers with a little extra incentive. Campaigns which reward users for buying your music or tickets to one of your shows are fantastic for giving people that little bit of extra motivation they may need to make a purchase which will help you drive sales and develop relationships. You can reward users for purchasing your music by using Gleam's Custom Actions to create an action where users can submit their invoice number in exchange for a reward. Coupon codes for discounts on future purchases. A redirect to a download for a bonus track. A coupon code or a redirect which allows users to claim some free merchandise. If you have some upcoming shows which you want to promote then you can run a Rewards campaign which offers users extra incentive to buy some tickets. If you use Eventbrite to create and promote shows then you can use our Eventbrite action to reward users who are attending your Eventbrite event. If you don't use Eventbrite then you can use a technique similar to the one we outlined above and use Gleam's Custom Actions to reward users who submit their invoice number. Coupon codes for discounts on your music. Coupon codes for free or discounted drinks at the show. Coupon codes for free or discounted merchandise at the show. Gleam makes it easy for musicians to engage listeners and drive action. Learn how to set up your own campaign or get started right away! Your website should act as a central hub for all of your musical activity. This includes audio and video content, album sales, tour dates, ticket sales, news and more. To help you make the most of your website you can use Gleam's Capture app to draw attention to matters of particular importance and drive action. If you've recently released an album or a track then you should be trying to draw as much attention as you can towards it. One great way to do this is by using smart popups and notifications to promote your new music to website visitors. This is an outstanding way to target users who have already showed interest in your music and drive listens, downloads and sales. You can use Capture to direct users anywhere your music is available, whether it be SoundCloud, Spotify, Apple Music, an online store or anywhere else. Nondescript Captures like a Bar or Notification Capture can be great ways to subtly draw attention to these pages without completely distracting from your site. However, if you want to drive traffic towards your music above all else then a more prominent Popup may be advisable. 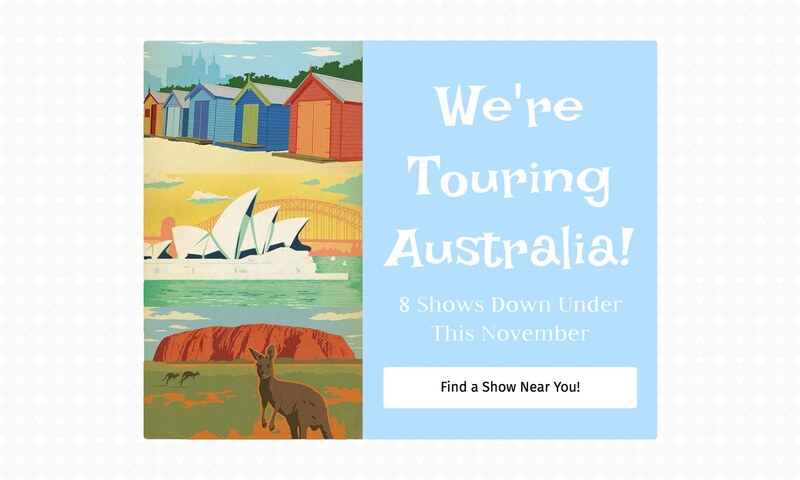 If you're going on a tour, or even just have a few shows lined up, you can use Capture to let visitors know that you have upcoming performances in their country. You can use the Country behavioural rule to determine who can view your Capture and create unique captures for every country you have upcoming shows in. You can use this tactic to create simple Popups and Notifications which redirect users to your tour schedule, or Coupon Captures which offer discounted tickets to users who sign up to your mailing list. Building a mailing list and using it to promote your music and keep fans up to date with your latest happenings is a powerful way to strengthen fan relationships, build loyalty, maintain interest, promote your music and drive action. However, for any of this to work you will first need to build your mailing list, and the best way to do this is by creating opt-in forms with Capture. You can simply ask users to signup in order to stay up to date with all your news and new releases or you can incentivise signups by offering coupons for discounts on your music or shows. This can be a particularly effective option as it will help you drive sales as well as grow your mailing list. Ready to Engage Your Fans? Check out our documentation on setting up your own Capture or get started now! If you have a website dedicated to your music then you should be using it to engage your audience and drive album or ticket sales. In order for you to effectively do this you will need to showcase your music in a highly engaging way. You can do this effectively by putting together a gallery of your music videos or live performances. With Gleam's Galleries app you can create elegant video galleries which can import videos from your YouTube channel and embed the gallery in your website for display. You can also easily curate your gallery, so if you only want to showcase a certain type of video such as live performances then you can achieve this with ease. Take a look at this demo gallery we put together to see what your own could look like. Check out our documentation on setting up your own gallery or get started now! Ready To Promote Your Music?